We fell silent at the weekend. Just momentarily, just brief pauses of remembrance. And yet, in those few minutes, I was struck by how much we said, how much we shared. I could feel it profoundly within my own home and I could see it clearly within the expressions of those whom we watched on television. What I was left with was two thoughts. The first being how wonderful it felt to step outside the hustle and bustle, to lose the constant background echo of noise, just for a moment. And the second thing that I was reminded of was how incredibly powerful silence can be. And yet, silence is something that we often seem to fear, diving in to fill gaps in conversation, in discussion, the weight of nothingness bearing down upon us heavily. Not least within the workplace. Meetings filled to bursting with comment and suggestions, participants barely pausing for breath, the verbal volley relentless. Or in management conversations, filling the space with talk. Often, as managers, we jump into the silence, our enthusiasm and commitment meaning that we are quick to offer support and guidance. But though we have good intentions, this can sometimes be disempowering. And perhaps too when speaking with a customer or a client, we may dive in with solutions, before we have fully heard what we are being told. So often we act to stop gaps before they grow into a lingering silence which consumes us with its awkwardness. And yet, when there is silence, that is when we frequently do our best thinking. Unimpeded by words, unfettered by questions, unrestricted by others’ opinions, our thoughts and ideas are able to run free and develop. Which can be incredibly empowering. 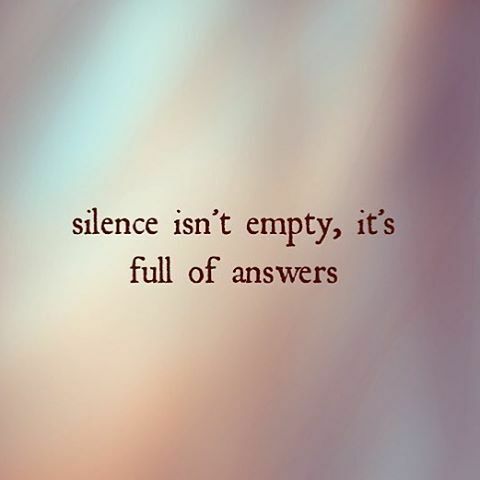 I have seen how powerful the use of silence can be in coaching, and in facilitation, letting stops act like pauses for breath, allowing individuals to reflect and think. And I have also seen how it can support truly productive and engaging meetings, where people have time and space just to think. Building silence into the workplace and within conversations helps set thinking free, and it allows people breathing space – which is good for everyone’s wellbeing.